Cahalen and Eli make music with the hands of master craftsmen wise beyond their years. They make music that's informed by the roots of American music, whether country, bluegrass, old-time, or blues, but also music that touches deeper than the tradition. It means something that the word about Americana roots duo Cahalen Morrison & Eli West spread first among musicians. Their debut album was passed around the ranks of some of the best American roots bands, raved about to fans online, and seen as a model to strive for in songwriting and musicianship. In this way, you could think of Cahalen & Eli as musician's musicians. They're the artists that other artists run to see at a festival. This is because their music seems effortlessly simple, but is complex enough to engage us far beyond the usual way we listen to roots music. Cahalen Morrison's songwriting is as much informed by the dark lyricism of Cormac McCarthy as it is by Appalachian stringband songs, and Eli West's angular, racing arrangements owe as much to the speed and aggression of early jazz as they do to bluegrass greats like Bill Monroe. Together they make music that draws from the well of American tradition, but reshapes these traditions into beautiful new forms. 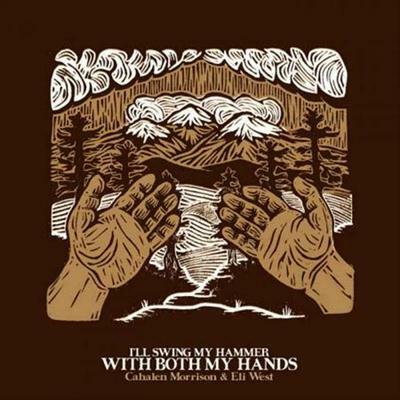 With their new album, I'll Swing My Hammer With Both My Hands, Cahalen Morrison & Eli West have perfected their chemistry as a duo, falling into long-form instrumental grooves and threading their vocal harmonies together as tightly as a weaver. Produced by Grammy-winning artist Tim O'Brien, they recorded the album at the Colorado Rockies studio of Aaron Youngberg. Colorado Fiddler Ryan Drickey returned for the album, and renowned Boston fiddler Brittany Haas joined on as well. Erin Youngberg played bass, and Tim O'Brien brought out the mandolin and bouzouki, but the focus here belongs on the musical intimacy shared between Cahalen & Eli. As instrumentalists (Cahalen on banjo, mandolin, bouzouki, and dobro and Eli on guitar and bouzouki), their interplay is revelatory. Their melody and harmony lines duck and weave around each other; an interconnected roots system of music that seems to have no beginning or end. Their vocals intertwine as well, with Eli's harmonies nudging Cahalen's melodies into new and unexpected directions. Here they trade the lead more than ever, with Eli moving to the front on songs like 'Pocket Full of Dust.' The traditional songs covered on the album are chosen with great care, from old-time singer Alice Gerrard's slow dirge 'Voices of Evening' to country legends The Louvin Brothers' 'Lorene.' As a songwriter, Cahalen has brought a lighter touch to his songs, as can be heard on 'James is Out' about an ornery mule, or 'Livin' In America,' a fun yet biting song about American privilege. But his raw, transcendent power as a lyricist is still on display here. Songs like 'Fiddlehead Fern' or 'Down in the Lonesome Draw' showcase his uncommon ability to use evocative natural imagery to channel human emotions. "On, 'I'll Swing My Hammer With Both My Hands" you can hear the flavors and feelings and stories of old bluegrass, mountain music, Texas Swing. Woody Guthrie and Bob Wills are lurking back there somewhere. It's all performed with deft voices, hands and hearts and huge creativity. Eli and Cahalen are master musical craftsmen, and this is a creative jewel." Cahalen Morrison Eli West Ill Swing My Hammer With Both My Hands 2014 from rapidshare mediafire megaupload hotfile, Cahalen Morrison Eli West Ill Swing My Hammer With Both My Hands 2014 via torrent or emule, full free Cahalen Morrison Eli West Ill Swing My Hammer With Both My Hands 2014, Cahalen Morrison Eli West Ill Swing My Hammer With Both My Hands 2014 rar zip password or anything related.